I have the orange runner in a hallway of my mid-century modern home so this style works well for me! The rug is thick and seems well-made. It gets a lot of traffic being in the only hallway in my house and has held up pretty well. I do have one snag but that should be easily disguised with careful trimming. 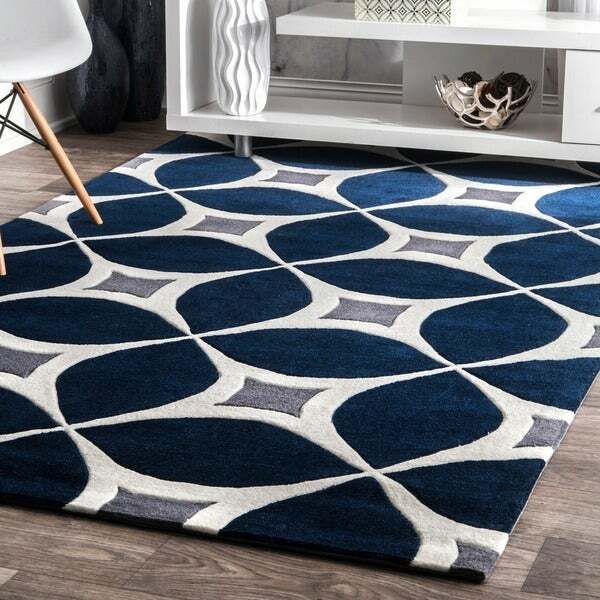 Featuring an elegant geometric pattern in rich shades of navy, ivory, and grey, this beautiful area rug complements any decor with effortless modern style. The plush, handmade polyester pile provides comfort underfoot. First off, this was a beautiful rug. I ordered it in the blue and was pleased with the color. I did think the lighter portion would be white, but it turned out to be cream which I felt made it look a little dirty. From a comfort stand point you couldn't ask for more, it was super soft. My main issue was the amount of shedding. I had it for a week, and in that time probably vacuumed it four times.....my vacuum was literally clogged with carpet fibers!!! 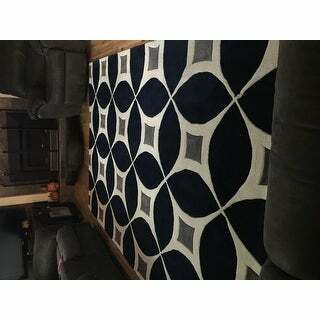 Overall, considering the price, I think it's a great rug. We love the design of this rug. We were a bit disappointed the colors were not as vibrant as the pics were showing. We ordered the Sunflower color. The sunflower color is not a bright yellow, but closer to a mustard color. The white in the rug is clearly off white. It would of been so much better if the colors were more true. However, we still like it enough to keep it. great looking rug. Note that the whitish part is more of a light beige or grey than true white ( I got the orange rug). There were some loose strands stuck to the rug here and there, however I think it was just a product of the manufacturing process (not that the rug is falling apart). Great style, looks perfect in our mid-century mod nursery.....very thick and plush, tightly woven, feels great underfoot. This rug is fantastic! It’s very thick and plush. I put a rug pad under it anyway and I’m very pleased with how it turned out! The color is definitely navy and I am very pleased with this purchase. The rug shipped very quickly and arrived within a few days of my order. Packaging was secure and protected. When I unrolled the rug it stayed flat, no need to weigh down the ends. It does not shed the colors are beautiful and I get many compliments on this rug. This rug is beautiful. I ordered the navy, gray and white. The colors are true - the white is white, not ivory. The blue is a true navy and the the gray doesn't have any blue hues to it. There are 3 very distinct colors in the rug. It is very soft and thick and is a beautiful addition to my daughters navy and gray room! Beautiful colors and awesome quality!!! The rugs are well made and at a great price! I purchased 4 and may purchase more due to the true colors and quality for other areas of our home. I love the great selection and prices at Overstock.com!!!! A very pleased customer!!! We loved this rug so much we purchased a second one! The colors navy grey white are very rich looking. When each one arrived and we opened them there was not odor and they laid flat immediately. I would recommend getting a nonslip pad to put under them as they will slid around without one. This goes great in the room they were purchased for and really add a richness to the colors in the room. I would recommend this product to anyone along with all of the other rugs we have purchased from Overstock over the last few years. This was definitely a great product for the price! I am looking forward to decorating my new house with products from Overstock. ORDER: 2'6" x 10' Runner for the Entrance Hallway DELIVERY: Great tracking. Wrapped tightly in thick plastic, no damage to the rug PRODUCTION: Unrolled easily and laid nicely. It's been a couple days now since arrival and the ends are laying well. I suspect they will be totally flat by mid week. LOOK: Very Retro, works beautifully with mid century! The Orange isn't as 'bright' as the picture, it's more a brighter rust, which looks amazing! I LOVE this rug, and it's VERY Plush and soft on the feet. Very expensive feel, almost like I don't want to use it in a high volume area. It's awesome, my cat likes to lay on it, that's how soft it is! END RESULT: I HIGHLY Recommend. I like color, so this is a perfect match. Brings out accent colors throughout, VERY Plush (if I haven't mentioned that already!). Great buy. luckily i still like the rug. looks good, but the orange is way more rust than the bright color pictured. others described it being spot on which makes me wonder if mine is a defect? i will likely keep it, but pretty bummed it's not that bright orange i was expecting. Now that I have had this rug for 18 months, I can say that I am not really impressed. The rug is a loop construction, so if you have cats or dogs forget it. Once they pull on it clumps of rug comes out. It's unfortunate because it is a beautiful rug. 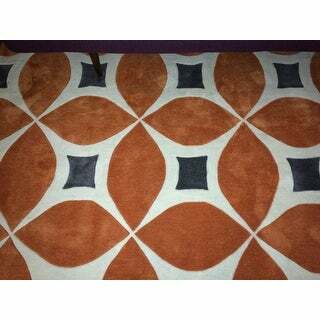 The is a great quality rug. The color I purchased was the blue. It looks wonderful in the room, opens it up, nice light feeling. The rug does show dust and dirt, its needs constant vacuuming. Not good for a heavy traffic room. I'm returning this item as the quality seems very poor. There are many frayed threads in the rug, and the areas where one color transitions to the next color seem to be "balding". Amazing quality, beautiful colors . Great purchase with an excellent price. 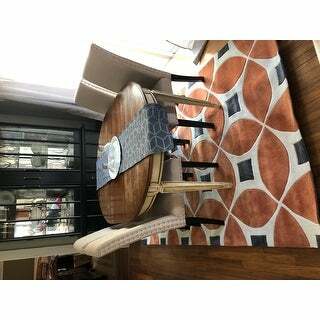 Burnt orange is a hard color to match and this rug complimented our kitchen colors exactly!! Love this rug! The color is deep and wonderful! 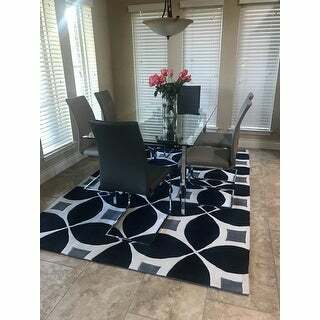 Loved it so much I bought 3 additional rugs for different areas in my home. Love it. Very plush and looks much better in person. I liked it so much that I ordered another one that is room size. Love how vivid the colors look and how soft the carpet feels under my feet. I dislike the bend of the edge of the carpet once it is unrolled. 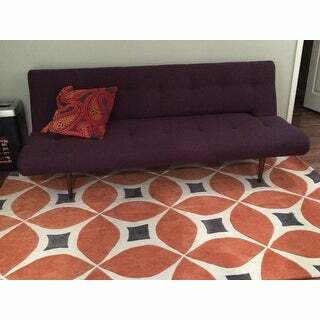 LOVE this rug. The colors are vibrant. The rug is thick and well made; nice backing on it as well. This rug came as advertised. Feels very good on your feet and doesn't feel cheap. Make sure you have a good vacuum to keep it clean and make the patterns and colors shine. "How do you recommend I clean it"
Vacuum with low-powered vacuum cleaner, clean with water and mild detergent, do not bleach, do not dry clean|. Professional rug cleaning recommended|, use rug pad. New rugs may shed initially. "Does this rug come in bigger sizes?" "Is this white or ivory? In the navy color rug"
"Is this available in 4x6?" This rug is approximately 0.75 inches thick.